After 21 years of advertising industry experience in print media, Reliance Online Marketing Co. was founded to bring to Qatar the new wave in advertising, namely Online Marketing. Reliance has teamed up with SearchMarketMe.com to bring their exclusive Online Marketing 2.0 system to Qatar. SearchMarketMe.com has a unique understanding of Online Marketing, having helped 97 different independently owned, and independently branded online marketing agencies around the world. Our mission: in Qatar is to bring the tremendous potential of online marketing to businesses that cannot afford a full-time marketing resource, to assist them in building their customer base, and to strengthen their relationship, thus enabling them to reach their goals. 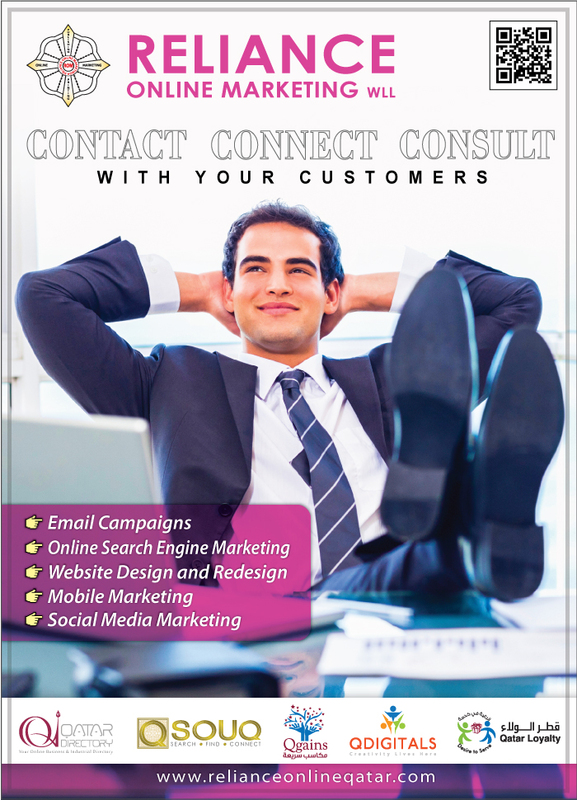 Our Philosophy is to provide you the best ROI (Return on Investment) with pragmatic, tailor-made, budget-based, industry-standard, personalized marketing solutions, working with you, and for you, side by side, to reach your goal of generating additional leads, and converting them into sales. Extremely useful to anyone who works in Doha! At our company, we use it to source potential clients and scope out businesses that we can help with our services. It has everything from timings to locations and key contact people, which makes our job a whole lot easier. It’s like Google…but for a Doha audience. It has everything business related that you can think of, and then some more. Even better, it’s mobile-friendly! So every time I’m in a bind and can’t remember what time a company closes or where they’re located, I look them up on the Oil and Gas Directory. There are a lot of things in Doha that are inaccessible to an expat, simply because we haven’t been around long enough to know where places are. And I’m not talking about the obvious things like groceries and malls. I’m talking about the smaller businesses that make life easier - AC repairmen, fridge techs, plumbers, car repair shops, curtains. The Oil and Gas Directory has been invaluable to helping me find my way around Doha and reach out to the people and businesses I needed to without hassle.